Ok i lied. I said to watch this space two posts down and here i am making up a new post. Well its cause the invention post came inbetween and i didn't want you to have to hunt for the mysterious new hook up for bids. 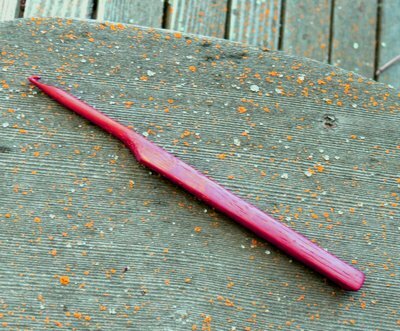 I found another piece of Padauk (also Padouk) and made a hook of it. The neck is tapered a bit like the Boye style hooks. Its also a bit longer (about 7 1/4 inches long) and made primarily for the toothbrush grip. Size is 6mm. Although this isn't wood from the ranch (its African), it is so pretty (no stain involved here whatsoever... this is the natural color), I couldn't resist making a hook from it. And because its such an oddity, i'm putting it up for bids here. I'll periodically edit this to post the current high bid. I think i'll close bidding on Monday the 22nd. muhahah I can't wait to get it! Hope it works well for you, Kari!